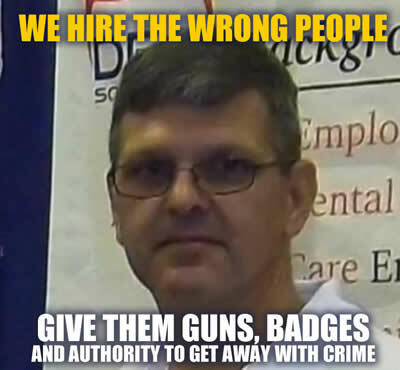 Officer Doug Rose is a typical example of how Police departments hire the wrong people, give them guns, badges and authority. The next crime is that Police departments allow this sort of scum to escape prosecution by the use of a loop hole. They never charge them or prosecute them for breaking the law. Thus no record, no punishment and they keep all their benefits. Free to go work at another agency and continue to commit felonies, violate innocent people and even murder. From a video from the body camera of the back-up officer in the incident. The body camera was worn by Officer David Selvidge, who was cleared by Chandler Police of any wrongdoing. Portions of the camera footage can be seen in the video player above. A woman handcuffed naked by a Chandler police officer who entered her home illegally is planning to file a lawsuit against the city. “I felt helpless. I felt violated. And honestly, I felt molested,” said Esmeralda Rossi. Chandler Police launched an internal investigation after the incident. One of the officers involved retired in the middle of that investigation. Police arrived at Rossi’s home after receiving a call about an argument between her and her estranged husband. When she answered the door, there were two Chandler Police officers. One of those officers was Officer Doug Rose. Rossi said Rose became very aggressive and she told him to wait at the door so she could go get a cell phone.